Since joining Yewdale in February 2011, Business Development Executive Jerry has become a recognisable face for Yewdale customers. Driving some 45,000 miles a year and covering the northern half of Britain (and the whole of Ireland for good measure), Jerry is clearly passionate about his work. We sat down with him to discuss his approach to business, how he helps customers and his thoughts as a member of the sales team. ‘I’ve always wanted to work in sales, but I think I’ve tried every job along the way,’ says Jerry looking back to when he first joined Yewdale. Coming from another family-run business, Jerry had held many roles, from office to warehouse. ‘I’ve even got a forklift licence (hopefully my customers won’t expect me to turn up in one the next time I visit! )’ he says laughing. With no previous background in blinds, Jerry set about learning the ropes at Yewdale some eight years ago, working in estimating, in-house sales and every other role in the process. He threw himself into it, learning the job as he went. ‘It’s great now we’ve got people at every stage of the sale now, it’s a lot more efficient,’ says Jerry. By 2013 Jerry was ready to hit the road and start to visit customers directly, on their terms in their businesses. ‘I had never done face-to-face before and to be honest, I didn’t really know what I was doing,’ admits Jerry. But we all have to start somewhere, and with the guidance from Sales Director Matthew, Jerry gained confidence, learning the principles and his own techniques and routine. Now, visiting customers is one of the highlights of the job. ‘I really enjoy interacting with customers, satisfying their needs, helping them get the project over the line,’ explains Jerry. With the team back in the office helping to gather as much information on a new customer as they can before Jerry visits, he is able to enter the meeting with an understanding of why they do what they do and the products they carry, making the meetings meaningful and useful. After all, if you’re going to drive all the way to the North of England, it has to be worthwhile. What motivates Jerry to get up every day and travel so many miles? Jerry’s favourite products are YewdaleKestrel® anti-ligature systems and YewdaleDefiant® Eden fabric. So, if you’re interested in joining Yewdale’s extensive network of customers and partners up and down the country, please get in touch today. Who knows, Jerry may be stopping by your workplace for a chat any day now! Enjoyed this article? 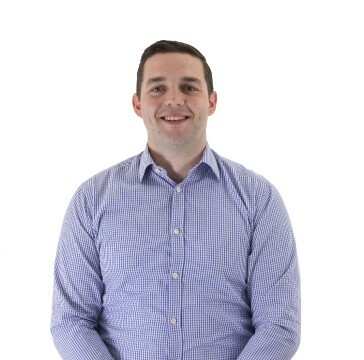 Take the opportunity to get to know Greg, Yewdale's other Business Development Executive. Read the article here.